It’s not an office without the water cooler talk. Let Gator Vending, Inc.show you how to upgrade your present water service and save money in the process. We provide everything for all your water needs. Our water filtration system takes ordinary tap water and converts it into healthy, clean and purified water. 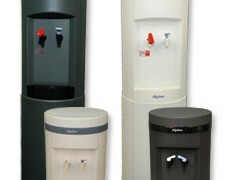 Our water coolers are among the best available for filtered water on site and remove many undesirable contaminants and eliminates objectionable tastes and odors. Practical – eliminating heavy bottles. Environmentally Friendly – reducing plastic production and disposal. Economical – with a high price/value ratio. Our water filtration system provides an unlimited supply of premium drinking water, at a fraction of what you’d pay for bottled water. In an office environment, productivity is increased as the staff has constant access to fresh filtered water and does not need to spend time changing bottles. With pleasant tasting fresh water, the habit to drink more is likely to evolve and make a healthier and more productive employee.